First, listen to the Equal Tempered tuning used to play a scale. This is the scale you will hear on a properly tuned piano. Now, listen to one of the many Chinese tunings used to play a similar scale. Unless you have perfect pitch, you might not be able to tell the difference without a better musical context. Later on in this discussion, you will be given an opportunity to hear identical melodies played in Equal Tempered and Chinese 12 Lyu tunings. (By "tuning" I mean a rule that one uses to determine how to tune the strings of an instrument such as a harp so that it will play the frequencies that it is supposed to play.) Because of the notes coming in a musical sequence, and because frequently several notes are played at the same time, you will be better able to hear the differences among the various tunings. Before we can talk about the Chinese musical scales, it may be helpful to review some things about our own music and what we consider to be harmonious. The original Chinese musical theory was probably developed by making rules for the lengths of a set of bamboo tubes that were made to be blown, perhaps in the way that people now blow over the ends of bottles to make a musical note. It will be easier to explain things in terms of stringed instruments. Let's start with a long narrow piece of wood that is over a meter long. At the left end (unshown) we will put tuning pegs, and at the right end we will put a resonating chamber. But for right now we are just concerned with what will be analogous to the long neck of a guitar with its frets. The vibrating part of our strings will be 100 cm. long. (Click the above image to hear the open string play.) Or click here . The easiest way to get harmonious singing is for everyone to sing the same note. But people sing in different registers, some high and some low. We say that they are singing the same note, but actually the frequencies they sing are found by doubling some fundamental frequency, doubling it again, and so on. We say that these people are singing an octave, or octaves, apart. Let's put a metal fret at the midpoint of the actively vibrating part of our string. If you halve the length of a string (and don't change its tension), then you double its frequency. (Click the fretboard image to hear the fundamental frequency and the frequency an octave higher.) Or click here . If we were actually to build this instrument, we could provide several strings. We could set them all to A=440, stop one string with our finger at the middle fret, and play that one and an unstopped string together. We would hear frequencies of 440 hertz and 880 hertz together. We could even add another fret a quarter of the way from the right end, giving us 1760 hertz. (Click the keyboard image to hear the fundamental frequency, the frequency an octave higher, and the frequency two octaves higher.) Or click here . 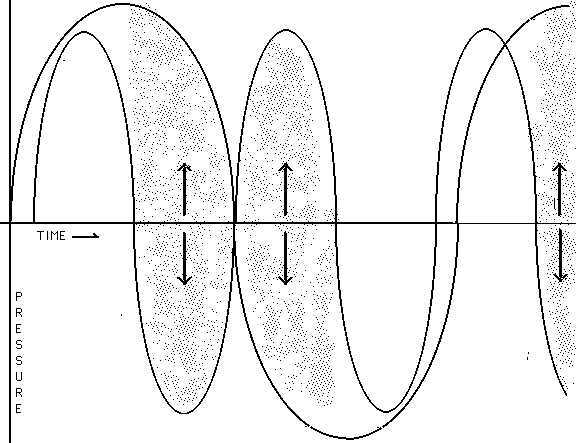 If we multiply the fundamental frequency (in this case 440 hertz) by an even number we will find that the high frequency waves fit exactly within the envelope created by the fundamental frequency. To human being, and apparently to many of our animal friends, such sounds are more pleasant. To experience a counter-example, try striking two adjacent keys on a piano, or playing two adjacent holes on a harmonica. Or, try listening to this recording of two guitar strings tuned so as to produce an unpleasant interaction. When two sound waves interfere, part of the time they augment each other, but part of the time one sound wave is trying to do the opposite of the other sound wave. The result is that the sound you hear comes and goes very rapidly. You will hear a kind of "wah, wah, wah, wah, wah" as a result. If you have a piano available, you can try various combinations for yourself. Playing four notes together, A, A an octave higher, F, and F an octave higher may produce some interesting results. You can also listen to a "wav" file below. This example gives the high F first, to demonstrate the highest note that is actually played in the second part. When the second part comes on, you may be able to hear two interesting things. There is a "wah-wah" fluctuation that occurs about every half second, and has a low, buzzy quality. There is also a high frequency tone, an octave higher than the single reference tone at the beginning of the recording that has a pronounced warble. Hear the high "ghost" instrument. In the graph drawn below, the grayed-in areas are the parts where the two sound waves interfere. You would hear the sound "drop out" at this point. We don't want an irritating fire siren type sound. So let's add a second fret that will give us harmony. We started with 100 cm. divided by 1. 100 cm. / 1 = 100 cm. Then we put down one fret in the middle. That's 100 cm./2 = 50 cm. and it gave us the octave. Now we will try 100 cm./3 = 33.33...3 cm. But putting a fret there would be too near the right end of the string. It would be an octave higher than we want. So we will double that length (making it an octave lower than it was). Then we have (100 cm. /3)*2=66.66...6 cm. L1/L2 = F2/F1 so F2= (L1/L2)*F1. In this scale, 660 hertz is E.
(Click the picture to hear this note play.) Or click here . 4/3 yields a D. The string length is about 75 cm. and the frequency is 586.6..6 hertz. 6/5 produces a string length of 83 1/3 cm. and a frequency of 528 hertz. That is a C.
So let's try 5/4. Following the mathematical steps shown above, that will give us a fret at the 80 cm. mark (20 cm. from the tuning pegs), and a frequency of 550, which is C#. 5/3 yields a string length of 60 cm. and a frequency of 733.3..3 hertz. That's an F#. The next multiple of the fundamental frequency we could try is 7. 7/4 gives us a frequency of 770 hertz and tells us to set a fret so that we can use a string length of about 57.1 cm. That will give us a G.
7/5 yields about 71.43 cm and 616 hertz for an D#. 8/5 yields yields 62.5 cm and 704 hertz. That gives us an F.
9 is the next multiplier, and it yields a frequency of 495 hertz and a string length of about 88.9 cm. That's a B. 15 yields a string 53 1/3 cm. long and a frequency of 825, a G#. 16/15 yields a string 93.75 cm. long and a frequency of 469 1/3 hertz, an A#. Now let's hear the diatonic scale (the one that goes "do, re, mi...") in that tuning. Click here . If you have perfect pitch, or even just perfect relative pitch, you may have been troubled by the feeling that certain notes on various musical instruments sound out of tune. And yet, all the musical instruments have the same frequencies. It's not the fault of your ears. It's because we play a tempered scale -- a scale that slightly detunes certain notes so that when a piece of music is transposed to another key it still sounds to us as though it is in key. Tables at the end of this article will show differences that cause problems when transposing keys in untempered scales, and they will also show how the Chinese gamut of frequencies differs from an untempered Western scale and the tempered Western scale. Now let's put down frets according to the Chinese method. This method has an ancient history, and was first written about in the Lyu Shi Chun-qiu, a text produced by the "think tank" of a late Zhou dynasty figure around 239 B.C., and the Guan Zi, a syncretic text attributed to a very early figure, Guan Zhong, who died in 644 B.C. The book may have been compiled in the late fourth century B.C., but may also contain materials going back to the historical Guan Zhong's time. The Chinese rule is very simple: Take 2/3 of the length of the open string, and put down a fret there. Then take 4/3 of that second length and put down a fret there. The third step is to take 2/3 of the last length, then 4/3, and so forth. Let's see how that works. (Click the picture to hear this note play. It is the open string, which will be set to 440 for ease of comparison, and called by the Chinese name, Huang Zhong.) Or click here . The first step is to put down a fret that will leave 2/3 of the whole string free to vibrate. If the open string is tuned to 400 hertz, then stopping a fret at the 2/3 mark will provide 660 hertz. This note is called Lin Zhong in Chinese. The second step is to put a fret at a point 4/3 of the stopped length of the string just determined. That fret will provide 495 hertz. It is called Da Cu. Step twelve uses 2/3 and provides about 892 hertz. Note that the true octave is at 880 hertz. Using this system would never permit derivation of the true octave. But the method used here continually divides frequencies by two (or multiplies string lengths by two) to make a gamut all the notes of which fall within one octave, so it is clear that the early Chinese had a definite idea of how to define and use the octave. The values derived in this twelfth step are not used in normal musical practice. The following is a comparison of the fret placement by the Chinese method (the lower set of frets) and by the Western method detailed above. If somebody took an ordinary guitar and redid the frets as a practical joke, the guitarist who tried to play a tune would surely feel that something was wrong. If a few more frets were put into the diagram of western frets to provide for some of the sharps and flats, then things would look a little better. But remember that the way the frets were originally set was according to what would make harmonious chords regardless of what key a song may be played in. If somebody moves those frets more than a tiny bit, then harmony will be replaced by discord. On the other hand, if a musician has an instrument like the bagpipe that is not very much like other instruments, then the only thing to do is to learn what can be done with that instrument that is musically interesting and pleasing. And any gamut that can be produced will present a different set of possibilities and difficulties. Traditional Chinese music uses a gamut of frequencies that are guaranteed to provide some level of discord in certain combinations that would sound more harmonious in the western musical tuning described above or even in the Equal Tempered tuning. But sometimes people like a little discord for the sake of spice, and a piece of music that is composed with the Chinese system in mind can sound more brilliant and endearing than the same piece played in the Equal Tempered tuning -- because most notes in that system are deliberately flatted as a way to provide a compromise tuning that will tolerate transposition from one key to another. Most of us grow up using the tempered scale which you can produce for yourself on any well-tuned piano. But that scale is mathematically rather sophisticated. (It involves complications involving the twelfth root of two.) Before that scale was invented, some less sophisticated scales were produced. Two of them are shown for comparison in the chart below. One of the reasons for inventing mathematically defined scales was to facilitate the creation of musical instruments that permit transposing from key to key. The advantage is that one can play in many keys without having many sets of musical instruments or constantly retuning one set of instruments. The disadvantage is that they are all compromises. They are all slightly out of tune and produce some degree of discord. Western musicians avoid discord by striking compromises. The present Western attitude seems to be that if transposing a song from the key of C to the key of E makes it sound different, makes some notes sound flat or some notes sound sharp, then that is a problem that needs to be solved. The Chinese knew about the tempered scale even before it was invented in the West, but they chose not to use it. They seem to have decided to put the differences to good use. If the equivalent of "do mi mi, mi so so" sounds different in the equivalent of their key of C and their key of E, then that is a useful thing because the feeling that goes along with those sounds is different. That is similar, but much richer, than our practice of having some songs written in major keys and other songs written in minor keys. In our own musical tradition, there was originally a richer musical palette that included a gamut of frequencies that was not our current equal tempered gamut, and several different modes or selections of notes to play on from within a gamut of frequencies, and the emotional characteristics of these gamuts and modes was also a staple of formal musical instruction. The Chinese system is based on the mathematical method of working back and forth by taking 3/2 of a base frequency, 3/4 of the frequency so produced, and so forth. Once a series of 12 frequencies is produced, they use each of those 12 frequencies as the fundamental frequency for a new scale. The result is 144 frequencies. (It turns out that there are quite a few duplications.) That gives the Chinese musician quite a large set of frequencies to play music with. If the musical intervals between notes were exactly equal, then the numbers along any diagonal that rises from left to right should be the same. But, in fact, the intervals are not equal, and the numbers along those diagonals are not always equal. Note that the bottom line turns out not to be a true octave above the top line. Each of the numbers calculated is somewhat higher than the octave.